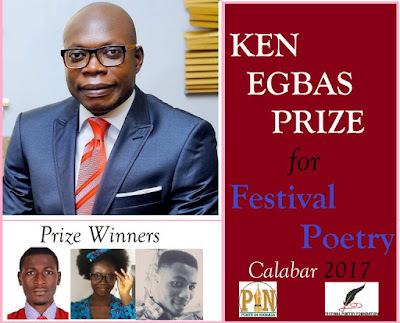 Poets in Nigeria (PIN) in partnership with Festival Poetry Foundation (FPF) is pleased to announce the call for submissions to the 2nd edition of Ken Egbas Poetry Prize. Sponsored by an art enthusiast and a Former Special Adviser, Strategic Planning at Cross River State – Mr. Ken Egbas; the prize is geared towards promoting cultural heritage, black pride and environmental consciousness. The Prize, an offshoot of the annually organized Festival Poetry Calabar, was launched in Calabar 2016 via an address delivered by Ken Egbas who promised to sponsor the prize uninterruptedly for 5 years. Entries must revolve around cultural heritage, black pride and environmental consciousness. An entrant is entitled to a single entry of limitless word count. Submissions must be original, intellectual property of the entrants. Previously published works (on social media, blogs and anthologies) are NOT allowed. Submissions including your name, location, biography and contact details should be in the body of the mail. Entering for the contest gives us automatic rights to make use of your works as deemed appropriate. Forward your entries to festivalpoetryprize@­gmail.com.